In this month’s cover photo a buzzard flies past the flare stack at the Wessel et Al 2-6A oil well in Hillsdale, Michigan (PN#58992). Buzzards seem to love to congregate around oil wells as they await their next meal’s demise. A buzzard circling a Michigan oil well is a fitting analogy for the June 2016 edition of RMP’s MOGM as we have seen few vital signs in Michigan’s oil economy so far this year. RMP wrote throughout the year in 2015 how it turned out to be the slowest year in Michigan’s history for oil & gas well permitting. RMP also wrote in 2014 that the forecast of activity in the coming years for oil production in Michigan was bleak; and that’s when prices were over $100/bbl. As it turns out, the numbers continue to support the forecasts made by our tiny little unfunded non-profit 501(c)3 organization month after month. The first six months of 2016 are currently & approximately five times slower than the first six months of 2015. Along with the dearth of activity, two of the top five operators in our Michigan Basin filed for bankruptcy in May. The future of the Hydrogen Economy and Fuel Cell Electric Vehicles, on the other hand, is clean & bright. By changing the powertrains in our vehicles, Michigan can create jobs for Michigan workers in a new clean energy economy full of hope & promise. Many jobs in the Hydrogen Economy will need the same skills possessed by workers in Michigan’s oil fields. The future of oil in Michigan is rife with buzzards and a legacy of contaminated ground water. Want to support oil field workers in Michigan? You should join RMP to help support Fuel Cell Electric Vehicle adoption. It’s our best bet for jobs & energy independence. We can turn waste into clean energy & be 100% energy independent. We will need pipefitters, electricians, valve makers, steel workers, construction workers, scientists, engineers, and dozens more. Help support RMP’s vision of getting Michigan caught up to the rest of the world with regard to smart energy solutions. Oil has helped America meet its energy needs for decades and will continue to be an important part of our economy for years to come. But, oil is now technologically obsolete and also the #1 financial resource for terrorist groups like ISIS. Responsibly migrating away from crude oil for energy is a smart decision for oil workers, our national security, and future generation’s prosperity. 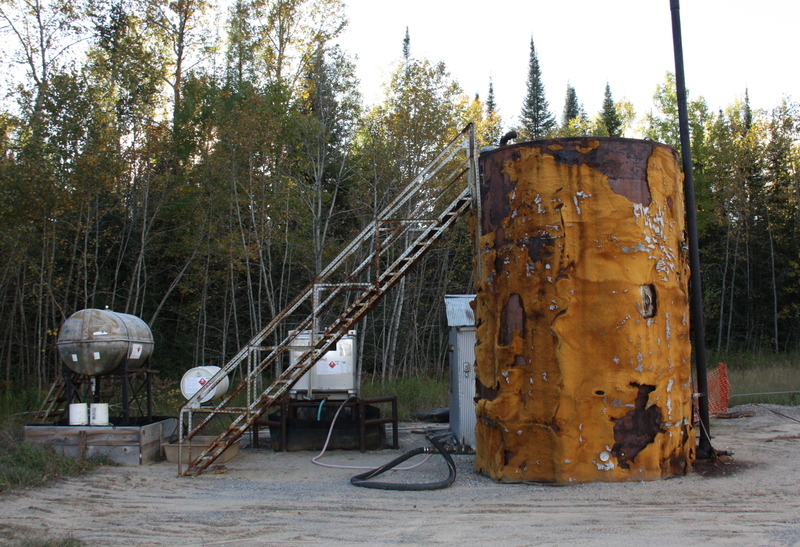 Breitburn’s Dover D1-5 gas well in Gaylord, Michigan. Breitburn is one of Michigan’s top 5 operators by revenue and they filed for Chapter 11 bankruptcy protection last month. RMP is following this unfolding story and you should follow us if you want to know what’s going on with Michigan energy. You can easily find any oil or gas well in Michigan on your smartphone using our mobile map @ http://www.respectmyplanet.org/public_html/full_screen/mobile_map. Bookmark that link on your phone and simply load the webpage to find oil & gas wells nearby. Click image to enlarge. A month has passed since the bankruptcies of Linn & Breitburn were announced. This is really the only story going on in the Michigan Basin and there aren’t many updates in the past month. RMP, like everyone else, will have to wait to watch these stories unfold. This is, however, a good time to reflect on the global economics & finance of energy and how it relates back to our Michigan Basin. RMP blogs about energy related to Michigan oil & gas but RMP is always focused on the bigger global picture of energy because everything is connected in our global economy. Understanding the finance & economics of global energy is just as important as understanding the nuts & bolts of British Thermal Units, megawatts, gigawatts, and joules. While the physics and science of energy production are the fun stuff, the finances are a cruel reminder that there cannot be one without the other. RMP tries to distinguish itself from other environmental non-profits in Michigan by making the finance & economics of global energy markets easier to understand. Let’s look at the basics of how any company or sector of our economy works and look at a financial bubble in general terms. A financial bubble has generic characteristics regardless of whether it comes from the housing market or energy markets. Lets look at some basics of the recent popping of the oil & gas bubble. That oil went from $100/bbl in 2014 to the under $50/bbl it is today in 2016 is the biggest indicator that we have a bubble that popped. If we remember back to the big financial market collapse related to mortgage CDOs (Collateralized Debt Obligations) in 2008, we can see similar characteristics with our recent energy bubble. Merit’s Frederic 10 Central Processing Facility in Crawford County Michigan. You can find any oil or gas well in Michigan very easily using RMP’s mobile webpage here: http://www.respectmyplanet.org/public_html/full_screen/mobile_map. Just bookmark the webpage on your phone and load it whenever you want to see what oil & gas wells are near you. Click image to enlarge. Insolvency is negative equity. Insolvency means your liabilities are greater than your assets. It’s the reason for bankruptcy. Insolvency is worse than illiquidity. Illiquidity means you have enough equity to be viable but you don’t have enough cash to handle something like a crisis payment. Illiquidity, for example, would mean that you couldn’t sell your car overnight to raise the cash to pay off some other immediate debt. Even though you have positive equity, because your car is a valuable asset, it would take some time to convert your assets to cash. Oil companies carry as assets something called proven reserves and they’re based on complex valuations hinged to oil prices. Valuations of proven reserves can be just as shady and confusing as the valuations of CDOs which Wall Street seems to relish since the 1999 repeal of the Glass-Steagall Act of 1933. As the oil & gas bubble replaced the mortgage bubble, we saw many of the same things happen before this recent collapse. Specifically, we adamantly saw bankers willing to trust market valuations of oil companies as recently as just a couple of years ago when they were profiting by writing loans to oil & gas companies and underwriting new security offerings. Now, we see the same bankers saying the exact opposite and that market valuations are wrong and they should not be trusted. Let’s talk about market equity versus book equity. Book equity is simple math based on figures on a balance sheet, but how accurate are those figures? How are the valuations of assets like proven reserves calculated? Maybe a company has some sort of brand charisma or some other intangible characteristic that makes the market think they’re worth more than they are on paper. In this case, traders were placing the value of companies like Breitburn & Linn higher than what the balance sheet says just a couple years ago because their proven reserves were valued higher than what they were actually worth because of a supply glut of oil. Merit’s famous Wood 5-11 well. Notice the soil venting equipment around the well head. Many ground water monitoring wells surround this well. Ground water has been polluted here because of the Wood 5-11 and yet it continues to produce unabated even as the well is in active remediation. RMP has been developing sophisticated mapping applications to find and mark these wells that pollute the water in our Great Lakes state. Click image to enlarge. Conversely, the opposite situation exists today in 2016 when a company is trading below its book value and we have a bailout scenario. In the situation we have today, the market thought the asset valuations on the balance sheets of Linn, Breitburn, and many other companies were inflated. And, just like we saw in 2008, the banks who helped structure the valuations for the loans and overleveraged scenarios of these oil & gas companies knew the valuations were inflated when the Saudi’s called the API’s bluff. We use market valuation as a truth detector (i.e. mark to market). The same people who said to trust the market when they were making large financial bonuses on the run up, are now ironically the same people saying the market can’t be trusted and that the assets are overvalued. All it takes is one of the banks holding the hot potato to make a call by basically saying I don’t want to renew any loans, I want my money back because I know you’re assets are at inflated valuations because I’ve been inflating too. This is when the bubble pops. Just like we found out a 1,500 square foot house in Livonia, Michigan isn’t really all of the sudden worth $300,000 by way of magic; we know now too, that oil is not worth $100/bbl even though it seemed so believable in 2014. Oil is worth about half as much as it was in 2014, just like the house in Livonia. As soon as someone big enough makes the call to say, if that crap is really worth what you say it is (and what I as the bank, allowed you to say it is worth), then why don’t you just go ahead and pay me back my cash. Financial leverage is your ratio of assets to equity. For example, if you’re controlling $10 worth of assets with $1 of equity, you’re leveraged 10:1. When you pay down your debt, you’re deleveraging. Just like calling in a game of poker, someone says, show me your cards. The company has to try to sell overvalued phony baloney assets to raise cash to pay down real debt. The banks knew many of the proven reserves assets were not worth face value when the Saudi’s turned the spigot because basic supply & demand manipulation could no longer be kept at bay. Saudi Arabia basically pulled the curtain back on Jack Gerard’s propaganda bluff like Toto pulling the curtain back on the Wizard of Oz. Supply of oil became so high as demand dwindled that a major correction was imminent. This means that all the buyers that were purchasing oil assets like crazy when the bubble was expanding all dried up in a hurry – the gig was up. 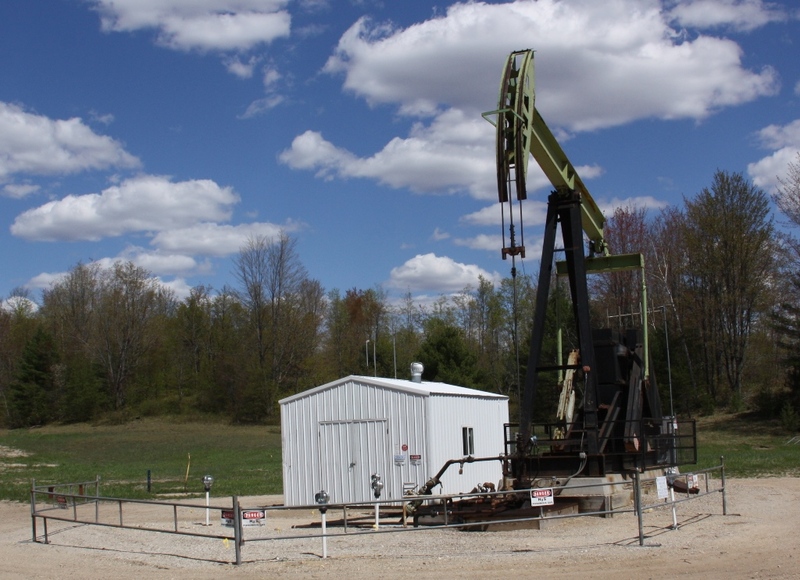 Terra Energy’s Melling Resorts 16-8 gas well (Permit# 46599) in Otsego County’s Dover Township June 2016. This well and many others literally sit right on the golf course at Treetops Resort in Gaylord Michigan. 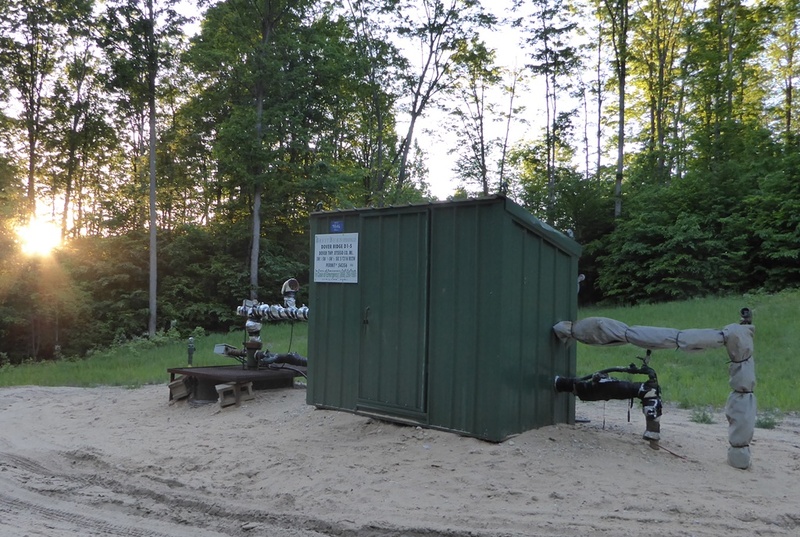 Gas wells are densely populated in Gaylord Michigan targeting the Antrim Shale. 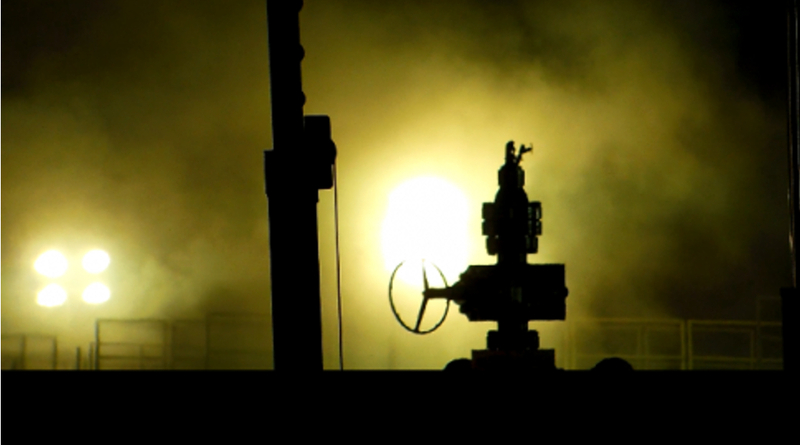 Want to learn more about oil, gas, and energy infrastructure? Follow RMP on facebook, Twitter, and our blog right here. Click image to enlarge. RMP has been blogging for years now how the USA only has 2% of the world’s crude oil reserves according to the EIA. The simple logic of these oil reserves versus the well financed propaganda peddled by Jack Gerard’s API saying that America is an oil powerhouse is very clear to reasonable thinkers. Any small group like RMP can write about this simple logic but who can actually do something about it? Well, in this case it was the Saudi’s. The Saudi’s can produce oil for under $20/bbl and can increase production by simply turning a spigot – which is exactly what they did. The truth that America is not a sustainable crude oil powerhouse cannot be made untrue by any propagandist or miser, regardless of their net worth. The Saudi’s called the API’s bluff on oil and the economic shockwaves have been reverberating around the world since. America’s economy is well diversified and therefore it’s only the oil & gas companies (and certain banks) that are really feeling the pain of the Saudi’s recent actions. RMP has also explained how energy expenses are actually a tax on Americans and to the extent our energy taxes (i.e. gasoline & diesel costs) have gone down on regular tax payers like me & you, the pain of this bubble pop was not felt on America’s economy at large like the mortgage crisis was. Other countries, like Russia & Venezuela, who’s economies are more closely tied to only oil have suffered even more because of Saudi actions. In Venezuela right now people are literally starving to death and having food riots reminiscent of the Libreta de Abastecimiento in Cuba. The Saudi’s may have even hurt themselves with their recent actions and may very well have their own steep price to pay for calling the API’s bluff. The electrification of the automobile will play an important role in why oil companies (even the ones as big as ExxonMobil, Royal Dutch Shell, British Petroleum, PetroChina, and Saudi Aramco) may never quite recover the same way from this recent bubble pop. The automobile, which originally gave crude oil a market, will also be able to take oil’s market share away if the automobiles manufactured do not need oil to run. Oil & gas companies are going to have to learn to live much leaner and America will have to export oil to keep the industry alive and workers working as we transition to fuel cell electric vehicles in coming years. RMP is going to start publishing more information about fuel cell electric vehicles and hopes to find others in Michigan that want to work together to advance fuel cells and clean sustainable energy in the Michigan Basin. If Michigan starts to advance fuel cell adoption, we can create jobs and actually achieve energy independence without pollution while improving our national security. America can keep our oil & gas workers employed using RMP’s advocated plan for fuel cell electric vehicles even as we responsibly migrate away from crude oil as an energy source. Making a migration to Hydrogen fuel is a sustainable energy solution that helps protect our fresh water natural resources and all of America’s workers. We can increase jobs, decrease unnecessary military spending, protect our environment, and improve our national security by switching to the Hydrogen Economy. In other Michigan oil & gas news, I got a chance to visit Gaylord, Michigan a little bit using my brand new 2016 GMC Sierra 1500 4×4 and RMP’s new mobile oil well locating software. Gaylord is a natural gas producing stronghold in Michigan. Harry S. Melling, the visionary and founder of Treetops Sylvan Resort in Gaylord, leased out many parcels of his land for natural gas production while he was alive. Some of the Melling gas wells producing today are right on the golf course. This month, I was able to combine my Google Maps API software testing with 72 holes of golf at TreeTops. I was also able to check out some oil & gas wells while I got to enjoy some Pure Michigan recreation on the links. 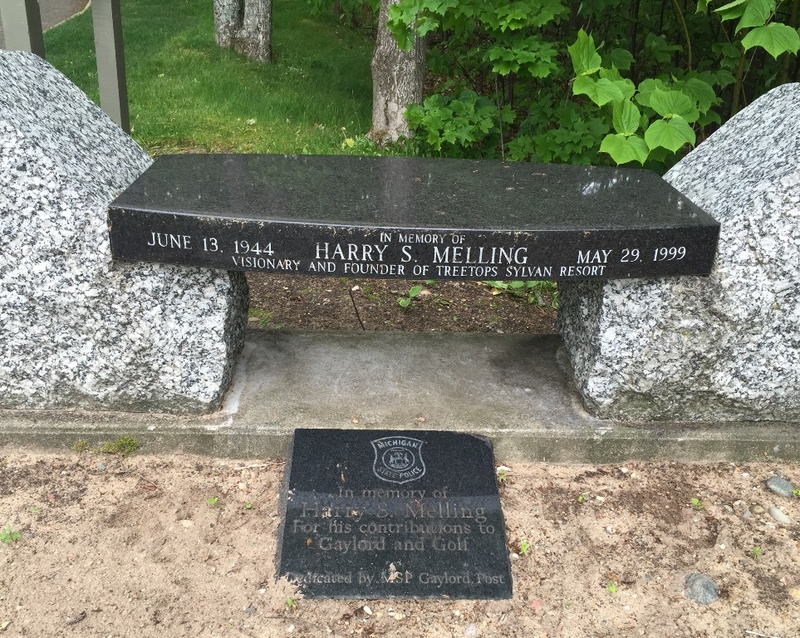 Harry S. Melling was the visionary & founder of Treetops Sylvan Resort in Gaylord, Michigan. Many people recognize Treetops from the recent shananigans pulled there from a UofM fraternity partying and destroying hotel rooms. Many people don’t realize, however, that many gas wells are on the golf course and surrounding area that have “Melling” in the well name. Click image to enlarge. As you get out into the woods in Gaylord the constant elevation changes are striking as most of Michigan is relatively flat. Big hills, small hills, steep hills, rolling hills and the two track dirt roads that connect them are fun to drive in 4×4. Gaylord is a great Michigan landscape with acres of beautiful scenery. If you want to find oil & gas wells near you, in Gaylord, or anywhere else in Michigan, all you have to do is load & bookmark RMP’s new mobile oil well locator webpage @ http://www.respectmyplanet.org/public_html/full_screen/mobile_map. 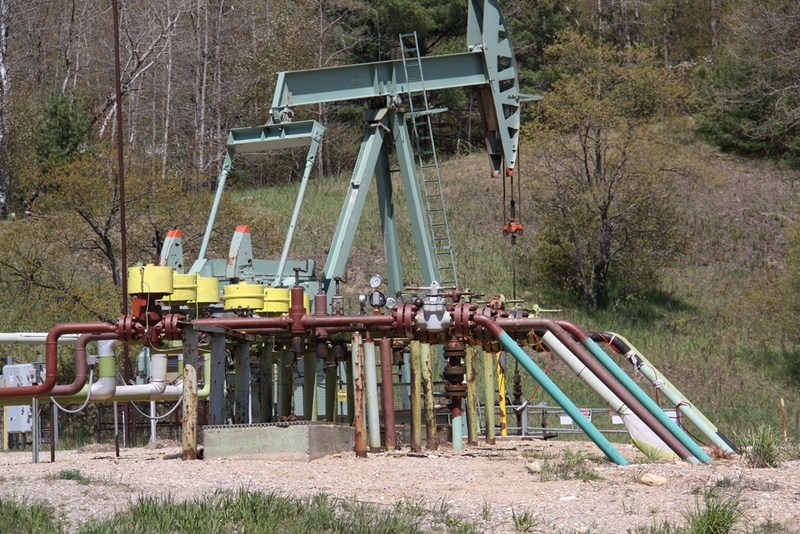 You can save it on your phone and find oil & gas wells nearby anytime you want. Simply load the page in your browser and RMP will locate your position and the nearest 500 oil & gas wells to your current location. The “You” marker indicates your position and moves as you move to help you find any oil or gas well in Michigan. It really is that easy. 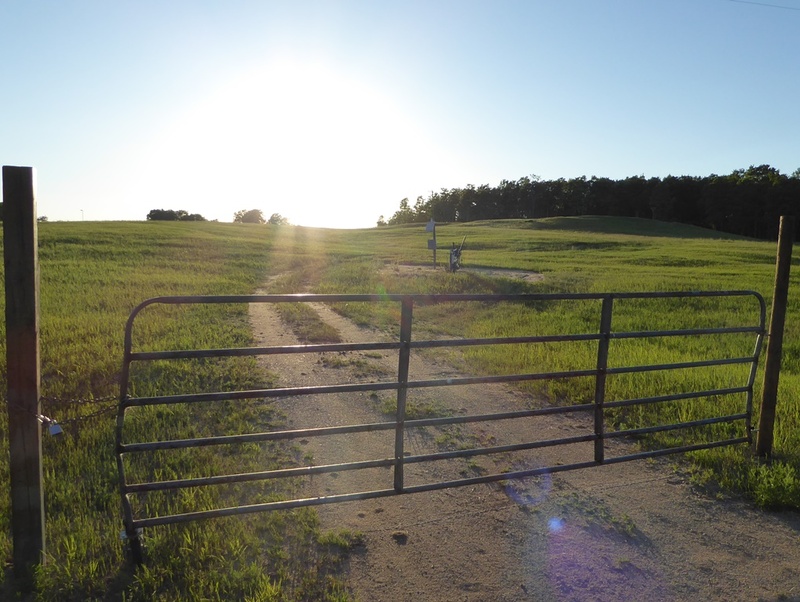 Remember to always get the landowners permission before you drive up any two tracks to view any oil & gas infrastructure if the infrastructure is marked as private property. RMP is obviously stretching to find topics to write about concerning oil & gas activity in Michigan as most all activity has come to a grinding halt with the bubble pop described in this edition and the bankruptcies it precipitated in two of Michigan’s biggest oil & gas producers in our basin. We will keep reporting the numbers and be on standby if any oil & gas activity gets going again but for now things are pretty dead. There is no new oil & gas activity even close to being on the horizon in Michigan that we can see. Below are June’s (absence of) numbers that continue to support what RMP has been saying since we started this monthly magazine in 2014. There is so little going on in the Michigan Basin as far as oil & gas development that there will be no table graphics updates for the applications, permits, and plugging charts this month. 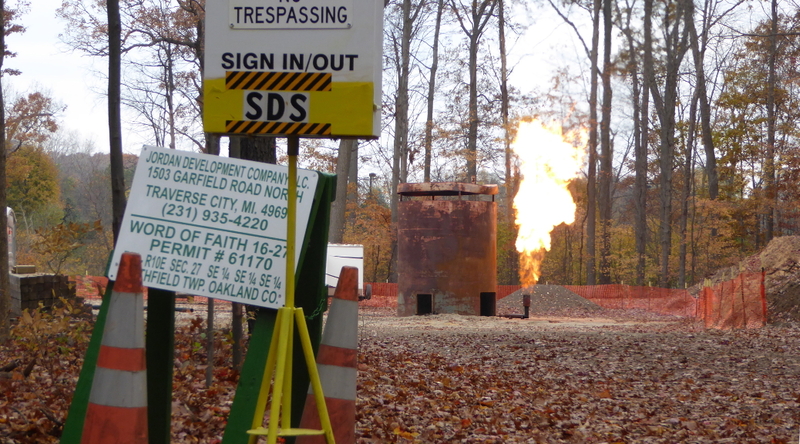 Michigan received only 1 application this month, issued only two permits, and reported only 1 well plugged. RMP has been testing our mobile location software as far away as Cabo San Lucas, Mexico which I had the pleasure of visiting in June 2016. Even though RMP’s datasets currently only cover Michigan locations, RMP’s software is “global ready” and RMP can make maps that are awesome all around the world. 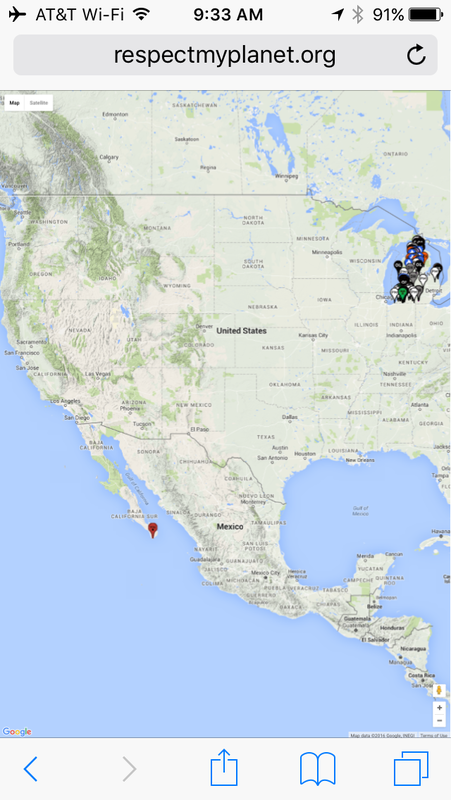 This image shows RMP’s mobile SW finding my location in Cabo and showing the nearest oil wells in Michigan. Make a tax deductible donation to our 501(c)3 organization if you want to help us bring more mapping capabilities to more people around the world by clicking here. Thanks. Click image to enlarge. Last year the big story on activity in the Michigan Basin was the speculation of “is this going to be the slowest year in Michigan history since 1931?” RMP reported that we were on pace to have 2015 be the slowest year in history and, in fact, by December 31, 2015 we broke the news first that it was in fact the slowest year in Michigan history. RMP follows Michigan oil & gas numbers closely in order to be able to publish such information. Well, the story so far in 2016 for numbers is that 2016 should easily shatter last year’s record lows for applications and permits. Last year in 2015 at this same point in the year (half way through), Michigan had received 49 applications for wells. So far this year in 2016, Michigan has only received 9 applications. 2016 is, so far, approximately five times slower than the slowest year in our history. Last year in 2016 at this same point in the year (half way through), Michigan had issued 54 permits for wells. So far this year in 2016, Michigan has issued only 13 permits. Again, the numbers just don’t lie. Oil is failing Michigan’s economy, the country’s economy, and the world economy. The argument RMP has been making for years is still as sound as ever: if you support oil, you support the number one financing source for terrorists and America’s enemies. There is no getting around this simple logic. The buzzards are circling. It’s time for legislation that creates jobs for Michigan workers and moves Michigan toward energy independence. It’s time to stop subsidizing energy that no longer benefits net wealth creation in America. It’s time to start patterning legislation in Michigan similar to that of California that incentivizes hydrogen infrastructure. Khan Academy provides world class free education to anyone who wants to learn.